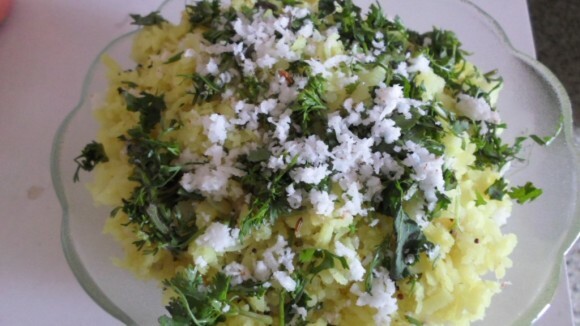 This is a Recipe for preparing typical Maharashtrian Dadpe Pohe. This is a traditional and authentic Maharashtrian Snack preparation made with Poha [ flattened rice] as the main ingredient. Served as a snack; normally for breakfast. First slightly roast the Poha for 2-3 minutes on a frying pan on slow sim. Then add Salt, Sugar, Coconut, Coriander, Onion, Green Chili paste, Groundnuts & Lemon Juice. Then mix it nicely, cover the pan and keep aside for 30 minutes. After that prepare the tadka and mix it with the poha mixture. While serving decorate with Coriander & Coconut.